This article is about the ODST who fought in Mombasa. For other people named "Jones", see Jones. "Let me give him my "Welcome to Earth" gift basket." Lance Corporal Jones was a UNSC Marine sharpshooter and Orbital Drop Shock Trooper stationed at Earth in 2552. He was under the command of Gunnery Sergeant Stacker, and was probably part of the 7th Orbital Drop Shock Trooper Battalion of the 105th Marine Expeditionary Unit as well. During the first day of the Battle of Earth, his squad was dispatched from the UNSC In Amber Clad from Cairo Station to relieve the UNSC's ground forces and to board the Covenant assault carrier, Solemn Penance. Shortly after deployment, their D77-TC Pelican dropship was shot down over Old Mombasa by a Type-47A Scarab walker. He survived the crash, but his squad was soon attacked by a Covenant patrol. When the squad was pinned down by a Kig-Yar Sniper, Jones, as the squad's own sniper, neutralized the Jackal with his "welcome-to-Earth gift basket", causing the majority of the other Covenant troops to flee the area. A camouflaged Sangheili then sneaked up on the squad and took Jones hostage by holding an energy sword held at the sniper's throat. One of Jones' squadmates, Butkus, wielding an overcharged plasma pistol, along with Gunnery Sergeant Stacker using his BR55 battle rifle, killed the alien and freed Jones. 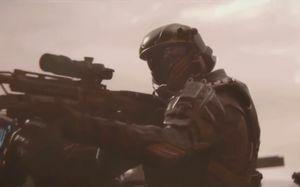 His subsequent fate is unknown, although it is possible that he returned to the In Amber Clad with the rest of his squad and accompanied John-117 to Installation 05, participating in the battle there. It is also possible that he was killed by the Slipspace explosion created as the assault carrier fled New Mombasa, or that he was killed in the combat that followed. Like all ODSTs, Jones is very tough and professional. He is an excellent marksman, and is not afraid of enemy snipers. He also has a notable sense of humor, even in combat, as evidenced by his desire to provide the Kig-Yar a "Welcome to Earth" 'gift basket'. When he is being held hostage by a Sangheili, he orders the team to kill the Sangheili instead of saving him. Jones is named after Jeremy Jones, a Bungie employee who worked on the animations in Halo 2. Jones has much in common with "Snaky", including both soldiers being ODSTs, both being Marine snipers, and both being lance corporals. It is unknown how "Snaky" could have escaped Installation 04, although he could have escaped along with Sergeant Stacker and Chips Dubbo. Jones and his squad take cover. Jones taken hostage by the Elite.